At least 32 workers were killed and two injured today when they were buried in white-hot molten steel at a metal factory in North East China, officials said. The mishap was triggered when a 30-tonne-capacity steel ladle sheared off from the blast furnace, spilling liquid metal onto the factory floor three metres below. The molten steel engulfed an adjacent room where workers had gathered for a routine shift change, the State Work Safety Administration said. Rescuers were unable to get closer because of the intense heat emitted from the “white-hot” liquid metal which rose to 1,500 C (2,732 F), according to the state-run Xinhua news agency. An industrial ladle was moving into the pouring position at the plant in the northeastern province of Liaoning when it sheared off an iron rail, spewing out its 1,500 degrees Celsius (2,730 F) contents. "The liquid metal engulfed the room, bursting through the door and windows and burying the workers," the China Daily said of Wednesday's tragedy at a plant belonging to the Qinghe Special Steel Co. Ltd. The Chinese authorities immediately launched a full investigation into the disaster, which concluded a week later on April 23. The factory itself was sealed off for the course of the investigation, a common practice in China, but work continued in the site office. 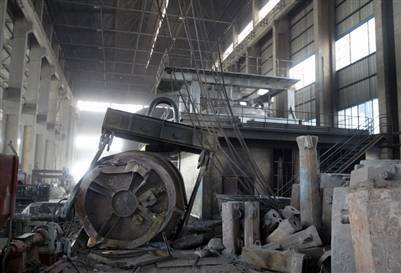 The investigation concluded that the direct cause of the disaster was Qinghe using a standard hoist instead of one specifically designed for dangerous smelting work. Other contributing factors identified were lax safety measures and "chaotic" management. The official report also stated that "Equipment and materials inside the workshop were messy, the work space was narrow, and safety passages did not meet requirements." The report goes on to say that the accident highlights poor working conditions and safety measures in the Chinese steel industry, "Some firms cannot adapt to the demands of rapid expansion and ignore safety... Safety inspection is not in place, leading to multiple accidents." and concluding "Work safety conditions in the metallurgy sector are extremely grim,". The bodies of the deceased were too badly burned to be recognizable, so DNA testing was used for identification. Within 24 hours of the disaster, officials had arrested the plant's owner and three employees who were in charge of work safety issues, and had promised the families of the victims a minimum of 200,000 yuan (US$26,000) each in compensation. According to Xinhua, the positions of those arrested were the manager of the mill, an operator, a technician and a workshop supervisor.